Before Vladyka George traveled to Mt Athos as a monk, he had no knowledge of how Orthodox Christians of other jurisdictions lived. On the Holy Mountain, he lived among Greek monks and met Russian monastics of St Panteleimon Russian Monastery for the first time, and became familiar with Orthodox pilgrims from throughout the world. There he came to know the lofty monastic ways and spiritual life of the zealous men of prayer. “All this helped me consider many church questions and understand that church life isn’t black and white,” said Vladyka George. On October 7, 2014, the Synod of Bishops of the Russian Orthodox Church Outside of Russia appointed Bishop George of Mayfield, until then a Vicar of the Eastern American Diocese, as the Vicar of His Eminence Metropolitan Hilarion, First Hierarch of ROCOR, of the Diocese of Australia and New Zealand and granted the title “Bishop of Canberra.” Vladyka George plans on relocating to the Australian Diocese after Pascha in 2015. —Your Grace, tell us about your childhood, your family, how you came to the Orthodox faith. —I was born in Bellville, IL, to a Roman Catholic family; my parents, Francis and Claire, were pious, humble people, and we went to church regularly. My aunt is a Catholic nun, and my older brother became a Catholic priest. I went to Catholic school, then Southern Illinois University. After graduating I came to realize that things are not all right in the Catholic Church, and I stopped attending Catholic services and began my search for the truth. I read about Buddhism and studied other Eastern religions. In 1974, I moved to California, to San Jose, and met a Greek man, through whom I became acquainted with the Orthodox Church, the lives of saints, and realized that I discovered the true faith. I was baptized in a Greek church in Modesto in 1974 and was given the name Macarius, in honor of St Macarius the Great, and began attending St Nicholas Church in San Jose. It was a big parish with remarkable people, most of the services were in Greek, so I followed along with an English service book. Subdeacon Macarius with Met. 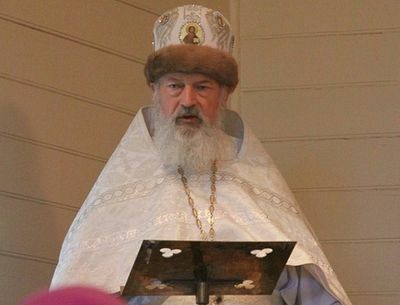 Philaret (Voznesensky). Then I began attending the Greek cathedral in San Francisco, as well as a Russian church. In January 1975, I visited Holy Mount Athos, which seized my heart, and I decided to become a monk. That year I visited Platina, California, where I met Fr. Seraphim (Rose and Fr. Herman (Podmoshensky). They suggested I enroll in seminary. Father Seraphim and Herman were not yet priests at the time. Visiting their hermitage left an indelible impression in me—it was an incomparable experience. I made confession every day, opening my heart, and morning and evening I ate with the monks. On January 7, 1976, I was received as a novice by Archbishop Averky (Taushev), who was then also the Dean of the seminary in Jordanville, NY. There were twelve American converts enrolled at the time. My day would start with studying, and after lunch, obediences. Among my many duties was cleaning, preparing meals, working on a tractor in the fields and digging graves. I spent the next summer in Platina, California. By that time, Fr. Seraphim and Fr. Herman were already priests. I helped them print books and do other jobs. It was much different from Jordanville: divine services were in English, and I understood every word, which touched my heart. Fr. Seraphim was closer to my heart—he was very humble, but at the same time a brilliant man who gave remarkable sermons. Fr. Herman was much different—he was more dynamic, more talkative. —Would you consider Fr. Seraphim a present-day saint? —I think so, but whether he will be canonized by the Church is a different matter. He made a great impression on me personally; he was different: he led a strict ascetic life. Frankly, I couldn’t live such a life myself. Platina is very remote. When I first arrived, the brethren were digging a well, before that they would walk to a nearby stream and used a hand pump to collect water for the monastery. This was the only water they had. The monastic cells had no heating. There were six to seven people living there at the time. After Fr. Seraphim died, most of the monks scattered, and now there are other people living there. —How was life at Holy Trinity Monastery after that? 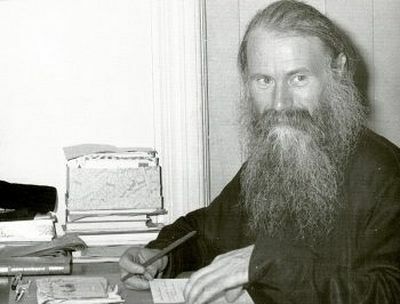 —On the Friday of the First Week of Great Lent in 1979, I became a ryassophore monk, and a year later, on the same day, I was tonsured to the minor schema and given the name Mitrophan in honor of St. Mitrophan of Voronezh. —Vladyka, whom do you remember best of all the monks of the monastery? —I especially recall Archimandrite Vladimir (Sukhobok), who worked in the chancery, and was a real “grandpa” to the young seminarians: he helped a great deal, gave money for food and clothing. He was always smiling and shone with joy every time we met. Everyone still remembers him fondly. Fr. George with Met. Laurus (Skurla). I remember Vladyka Laurus as a father figure to us all. The spiritual father of the seminarians was Fr. Ioanniky, an American who converted to Orthodoxy and learned to speak fluent Russian. Fr. Ignaty worked in the print shop, Fr. Gury led the choir and taught at the seminary, and also made grave stones. The renowned Fr. Job dug the cemetery graves, and drove the tractor. Fr. Flor was the master of all hands at the monastery. Archimandrite Cyprian (Pyzhov) painted church frescoes and icons, Archimandrite Antony (Yamshchikov) worked as a typesetter and was a spiritual father to many laypersons who would visit him from all over the country. Fr. George with Archim. Antony (Yamschikov) in the printing shop of the Holly Trinity Monastery. —What qualities, what spiritual experience, did you garner from them? —I remember that all of them, the old monks, shone with love, and I felt that whenever I was with them, it was like I was with a grandfather. They were always prepared to help in any way, in anything we needed. They did not criticize; they were willing to lend guidance to young monks and seminarians alike. We were like a big family. —So, having received this spiritual experience, you can easily discern who is a spiritual person? —A spiritual person and a true spiritual father are discerned by the love they express: understanding what a person needs and the willingness to help. This is what love means. And along with love, to give guidance and lovingly tend to the successes of one’s neighbor. —Your second trip to Mt Athos took place in 1981, after you graduated seminary. Monk George on Mt. Athos. —I asked for the blessing of Vladyka Laurus and went to the Holy Mountain. At first I lived at St Elias Russian Skete, which was then in the jurisdiction of the Russian Church Abroad. This was a very strict monastery. 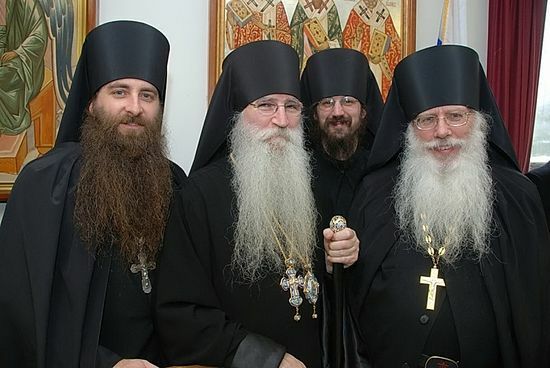 I spent several months there, and then Elder Nicodemos, who lived in Karoulia, suggested I live in a cell where four monks from the Russian Church Abroad lived. We had a daily cycle of services. One of our monks, Fr. Theodore, was ordained to the priesthood by Bishop Mark (Arndt). Everyone in the cell spoke English. The Greeks often sent American pilgrims to meet with us. So even there, in the woods, on an isolated peninsula, we heard about Orthodoxy throughout the world. There was a series of monastic cells around us, and on big holidays we would attend each other’s divine services. Before then, I had almost no contact with Orthodox Christians of other jurisdictions, especially monks, and I was very interested in learning about the Greek style of services and monastic life. On Mt Athos I was tonsured to the great schema by Hieromonk Chrysostom of Koutloumousiou Monastery, and given the name of George in memory of Great Martyr George the Victory Bearer. The Holy Mountain is a land of monastics, of ascetics. There was no electricity there at the time. A generator was used in some monasteries, which allowed electric light to be used for a few hours. There was no electricity at all where we lived, so we used candles, kerosene lamps, and wood stoves. But for the first few months I was there, they didn’t even have stoves, so we slept in our clothes and shoes. We would go to Karyes for groceries—that’s the capital of Mt Athos. —Was life on Mt Athos more strict than in Platina? —It was different. Each monastery on the Holy Mountain has its own customs. This includes divine services and other facets of monastic life. —Was your cell connected in any way to St Panteleimon Monastery? —Yes, but we had limited contact. There were some forty monks there at the time, now there are 80. Elder Elias lived there then, but when the USSR returned Optina Hermitage to the Church, he went there to rebuild the monastery. In the 1980’s, this was great news for us. —Did you meet any present-day saints on Mt Athos? —Not far from us lived Elder Paisios, called the Agiorite, who was recently canonized by the Greek Church. We would see him sometimes. Our cell and the skete where the elder lived were part of the same monastery, Koutloumousiou. The entire peninsula is divided into zones, and each part of the Holy Mountain belongs to one monastery or another. On great feast days we would go to the monastery and see the elder, and the head of our cell, Fr. Theodore, went to him for spiritual guidance. —In 1986, you returned to Jordanville. Did the monastery change during your absence? —The monastery was the same, but the people were different—new monks, new seminarians. Some of the older monks had departed in the Lord. My new obedience was in the print shop, where I worked from 1986 until 2008, before I became a bishop. In those years I began helping at Holy Cross Monastery in St. Louis, which later moved to West Virginia, and in 2009, and became independent, having earlier been affiliated with Holy Trinity Monastery in Jordanville. Metropolitan Hilarion gave me the blessing to move there. Now I will be leaving, and Igumen Seraphim (Voepel) will become the abbot. —Vladyko, do you consider the episcopal service to be an obedience? —Yes, that is exactly what it is. I was perfectly happy working in publishing, editing Orthodox Life, being the ekonomos [monastery manager] of Holy Trinity Monastery, being the abbot of Holy Cross Monastery, and never thought about becoming a bishop. At the time I had no internet, and I only learned of my new appointment from being congratulated by friends. With the monks of the Holy Cross Monastery, Wayne, West Virginia. —What do you consider your main duties as a bishop? —First of all, giving guidance to people, including laypersons, towards the Kingdom of Heaven, to try to help each person on the path to salvation and lending support. —Is the best form of support on the path towards salvation one’s personal example? —Personal example, yes, but sometimes you need to make adjustments: some need stricter guidance, some need more love; some need help changing their lifestyle, to repent and think about salvation. I spent my entire life charged with various duties, and I was surprised, especially in the early days of my appointment, that I needed to be honored by other clergymen and laity, and that some felt fear at the presence of a bishop. So becoming a bishop was a revelation to me, and I had to adjust to this way of life. I learned to become a bishop, to interact with people on a different level, and with each day I found out how much work I was faced with as a bishop. —Vladyka, when did you make your first visit to Australia? —Two years ago I spent two months in Australia. —Is the life of an Orthodox Christian is different in Australia than in America, where you were born and spent most of your life? I know many of the priests in Australia from seminary, some of whom I worked together with in the print shop, and I was very happy to see them again, to get to know their families and children. Bishop George at the Transfiguration Monastery in Bombala (Australia). Of course, I will miss Holy Cross Monastery, because monastery life is a part of me, it will be difficult to live without the daily cycle of divine services. It is difficult to leave the monks, the parish families, whom I became very close to in recent years. I hope we keep in touch, and that I am able to visit. —Vladyka, you are leaving for Australia after Pascha. How do you intend to provide spiritual support to the faithful during Great Lent? —I commemorate the priests during Liturgy, and maintain prayerful communion with each one. I constantly think about the priests and parishioners and think about what can be done to strengthen and support Orthodoxy in Australia. And of course, first of all I consider my appointment to Australia as an obedience, and receive it with joy. The Fund for Assistance Asks "What if There Were No Jordanville" The Fund for Assistance Asks "What if There Were No Jordanville"
"Here at the monastery, we are often tempted to complain about conditions not being exactly what we want them to be," explains Fr. Alexander. "It’s very easy for us to think that, in order for us to be saved, in order for us to have a successful monastic or spiritual life, or Christian life in general, we need the right conditions to live in, the right church to pray in, the right financial stability, the right order to our lives and our prayer. However, oftentimes these conditions are not present, much like today when we as Orthodox Christians are a minority in America. Orthodox in Australia acquiring abandoned Catholic, Protestant and Anglican churches. An Interview with Protopriest Michael Protopopov Orthodox in Australia acquiring abandoned Catholic, Protestant and Anglican churches. 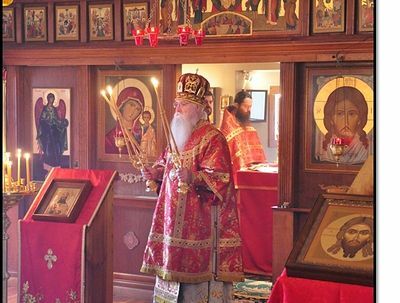 Warrnambool, Australia – On the Sunday of the Holy Fathers of the 1st Eccumenical council, the Russian Orthodox community in the Australian city of Warrnambool celebrated their Parish feast day and a 10 year jubilee since the day the parish was converted from a historical Anglican Church to a thriving Russian Orthodox Parish. In mark of this event, Protopriest Michael Protopopov gives an interview to www.pravoslavie.ru to discuss the reasons why Catholics, Protestant sand Anglicans are deserting their churches. I remember Vladika as Fr. George when I was growing up in Jordanville. He once came to our home for dinner when we lived in Van Hornesville (near Jordanville). Vladika if you ever get a chance to read this, say a prayer for the servant of God Paul Shkolnik and his family that spent many years near the monastery in Jordanville. May God bless you and grant you peace and strength for your new undertaking! This is indeed an inspiring interview 'great and nice' describes the wonderful presence of Russian Orthodox Church in the world. Truly this interview strengthens the ROCOR faithful throughout the world!! May the Heavenly Father grant health, prosperity and many good years to Vladyka George Schaefer of Mayfield!! A wonderful interview and a great inspiration for a new comer to Orthodoxy. God bless.